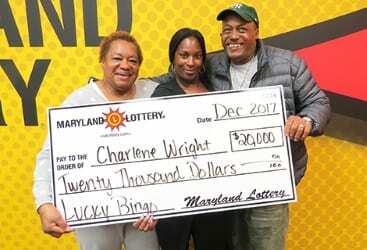 Among the happiest folks at Maryland Lottery headquarters on Tuesday were a Rosedale trio that claimed a $20,000 winning Lucky Bingo scratch-off. The husband and wife team were joined by his mom to talk about finding good fortune while on a shopping excursion. Charlene Wright buys scratch-offs occasionally, when she feels luck is in the air. She always had always selected $1 instant tickets – until Monday, December 4. “I was picking out a $1 ticket yesterday when my husband interrupted me,” she said. A fan or $2 instant games, her husband, Charles, pointed to the $2 Lucky Bingo scratch-off, telling her that it was the game for them. “I didn’t have a strong feeling one way or the other, so I chose the one he wanted,” she said. Scratching off her ticket later at home, Charlene wasn’t sure at first just what she was seeing. The 40-year-old mother of four is happy that her winnings will help make Christmas extra special for the family this year. She slept like a baby the night before they brought the lucky scratch-off to Maryland Lottery headquarters. The $20,000 win is the first gift of this holiday story. The second one goes to Liquor Depot located at 5860 Baltimore National Pike in Baltimore. The Baltimore County retailer earned a $200 bonus for selling the top-prize winning ticket in the game.